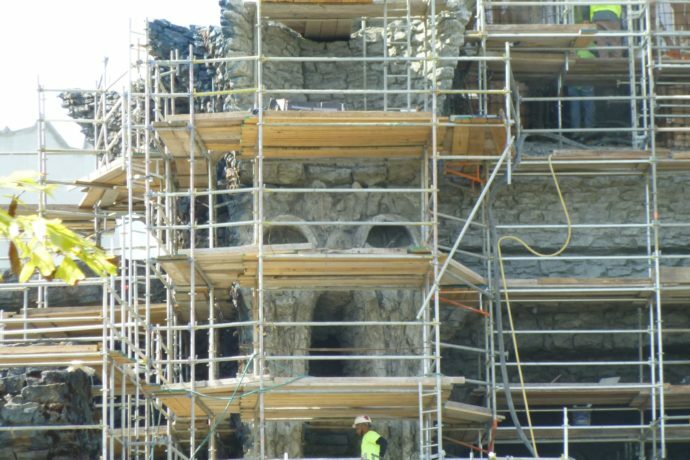 Workers are making quick work of the rockwork at the new King Kong attraction and Skull Island area at Islands of Adventure. A few faces have started to take shape around the entrance to the temple ruins. The paint-work is looking very complete on the left-side of the building. Most of the exterior walls are complete throughout much of the structure and from what I can see the interior work is coming along nicely as well. Check out all of the pictures below. There have been rumors flying around the web now that the Australian company Creature Technology will have some hand in the animatronics for the ride. They were responsible for the incredibly impressive King Kong puppet from the Kong musical. Watch this video for a sample of the giant Kong puppert-work. They were also the studio behind the beautiful Walking with Dinosaurs puppets and animatronics from its arena show, which I can tell you from seeing it in person, is just amazing. See a sample of that work here. If they apply their skill to create expressive puppets and impressive skins to the figures in the Kong ride I will be very pleased. Beautiful rockwork paint-job, looking nearly complete over here. Epic temple entrance. Can’t wait to enter there in the ride vehicle. A face appears on the facade front. And one more to be added on the right. And another face is appearing above the temple gate as well. Facade supports all installed on the right side of the temple. Walls still being added to the right section of the structure. You can see the opening where the vehicles will come out for the outdoor scene on the right. The mountain range looming behind Thunder Falls isn’t as bad as I would’ve expected. I leave you with a couple snapshots of some live entertainment at Port of Entry in Islands of Adventure. With the big spring break crowds in the park you’ll see a lot more roaming entertainment that’s not always around. Limbo limbo limbo! How low can you go? Also, be sure to check out the recent Garden of Allah Villas Construction Update at Universal Studios Florida.